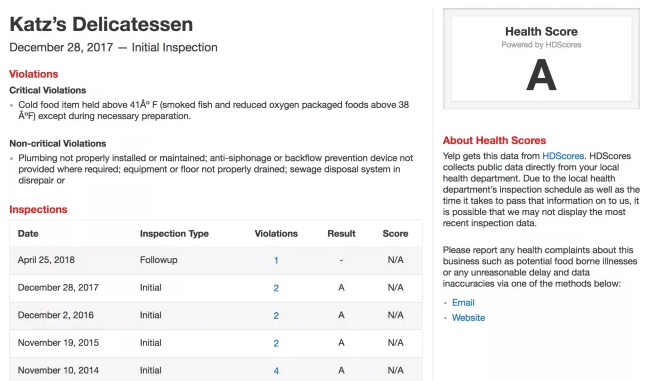 Yelp’s new feature might help you avoid food poisoning. The platform announced that it will begin featuring hygiene scores of restaurant alongside reviews, photos, and other information. The feature is currently only available in California, Illinois, New York, Texas and Washington, DC, but Yelp says it intends to roll it out in other states soon. Yelp’s public policy boss Luther Lowe wrote in a blog post that cities have been doing restaurant inspections and providing information publicly for decades, but that the information is often “beyond the easy reach of consumers.” So this move puts it front and center.